SSC North-Western Dy. Regional Director Mr. S.K. Ranjan has posted on twitter today while giving a reply to one of the aspirants that the syllabus and exam pattern of SSC CGL 2014 exam is going to be changed. Check the image given below that consists of the tweet of S.K. 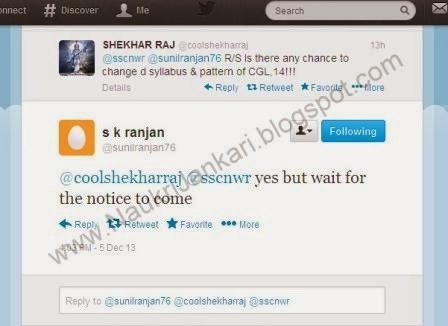 Ranjan sir regarding changing of SSC CGL 2014 exam pattern. Although S.K. Ranjan sir did not mention about the exact new syllabus and exam pattern of SSC CGL exam 2014, he advised to wait for the official advertisement. So, be ready to welcome the change! Don't waste a single second, prepared well for SSC CGL 2014 exam. Check here for SSC CGL 2014 Official Notification, Syllabus, Pattern of Exam. 0 comments for " SSC CGL 2014 Syllabus & Exam Pattern going to be changed "